At AWS re:Invent 2018, Billy Liu and Jimmy Tam from Disney Streaming Services took the stage to talk about how they use Amazon Pinpoint to meet some of their unique digital user engagement needs. Disney Streaming Services supports several mobile apps, including MLB At Bat, Ballpark and Beat The Streak from Major League Baseball, along with the NHL mobile app. Billy and Jimmy shared their story on the re:Invent Launchpad stage, as well as during the Digital User Engagement Leadership Session with Simon Poile from AWS. In these sessions, they discussed how they use Amazon Pinpoint—along with other AWS services including Amazon Kinesis, AWS Lambda, Amazon S3, and AWS Glue—to target customers, monitor the performance of their campaigns in real time, and gain a deeper understanding of their users’ needs and desires. When you consider the use cases for MLB’s suite of apps, you can quickly see why sending the right message to the right customer is a more complicated task than it might seem at first glance. For each of the 30 Major League Baseball teams, users can opt to receive eight different types of messages. Each of these eight message types is available in both English and Spanish. And on top of all that, each push notification sent has to target combinations of these segments when two teams play each other. There are thousands of possible segments and combinations of segments to consider with each message sent. To address this issue, Disney Streaming Services uses Amazon Pinpoint to dynamically create unique segments and campaigns for every event in milliseconds. In the most demanding usage scenarios, Amazon Pinpoint scales to create over 300 segments and campaigns per hour, and over 20 segments and campaigns per minute. To learn more about how they solved this challenge, take a look at the recording of their session. 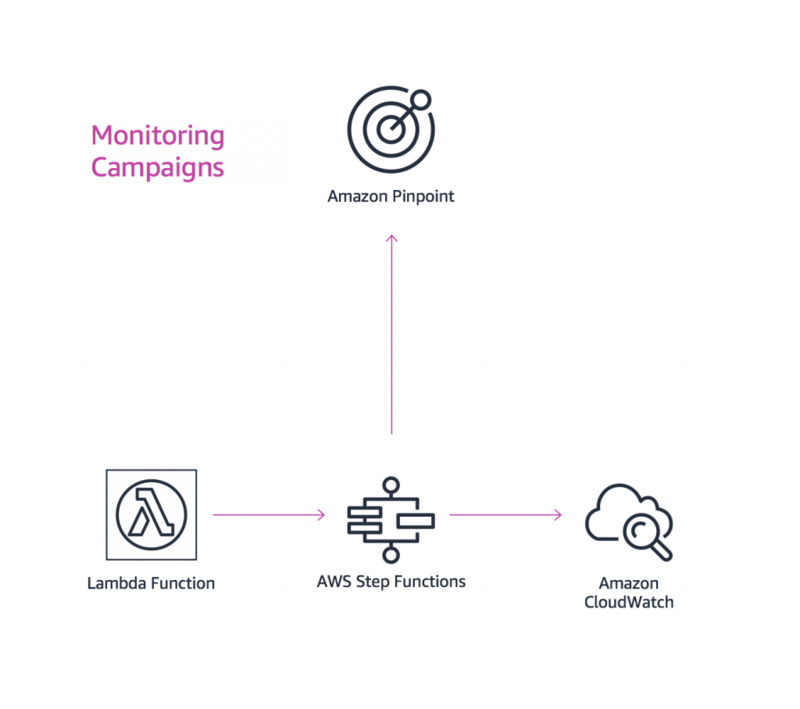 With the fast-paced nature of Disney Streaming’s notifications and the sheer number of campaigns and segments they are targeting, monitoring their performance directly in the Amazon Pinpoint console is not scalable for their use case. However, they must have real-time notifications to let them know if their campaigns are lagging or not reaching the expected number of recipients. 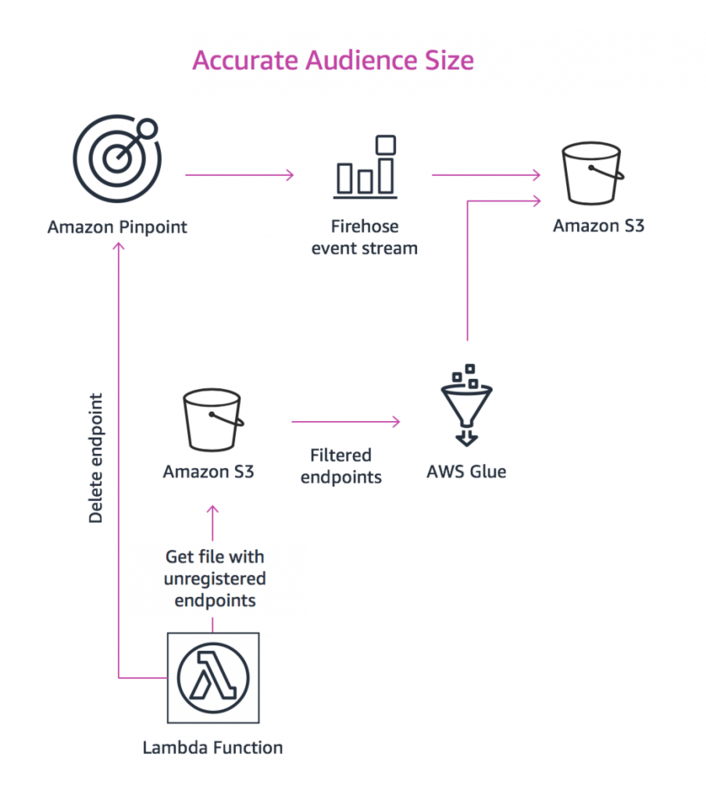 To meet this unique need, Disney Streaming developed a solution that uses AWS Step Functions, Amazon Cloudwatch, AWS Lambda, and Amazon Pinpoint. This solution monitors each campaign that is created. When a campaign is executed, their solution streams data about the execution and delivery of that campaign, and sends alerts when the team needs to take a closer look at how their campaigns are performing. You can learn more about the specifics of their monitoring solution in the recording of their session. After a campaign has been sent, Disney Streaming analyzes the performance of campaigns. By performing this analysis, they can better understand how customers engaged with notifications, and ensure fans are receiving a compelling experience. To achieve this, Disney Streaming uses the event streaming and exporting features of Amazon Pinpoint. They stream engagement events by using Amazon Kinesis. These events let them know how fans interacted with the application, and allow them to drill down into various performance metrics on a per-team basis. They then store these metrics in S3, which are picked up by their data lake team for further processing. By using this solution, they can create near-real-time reports for the unique audiences. They also use the Amazon Pinpoint API to export all of the details about the users to an S3 bucket using Lambda Triggers. An AWS Glue job processes the exported data and outputs the results to another S3 bucket. The data lake team then uses this data to glean additional insights about their audience. Disney Streaming also uses a custom solution to engage with customers who are still able to receive messages, and to ensure that reports only include engaged users. For example, if a customer uninstalls the MLB or NHL apps, re-installs an app but doesn’t set their messaging preferences, or starts using a device on a different platform, that customer might not be able to be contacted. Disney Streaming needs to remove these unreachable customers from campaigns so that they can maintain accurate reports on audience sizes, helping keep costs low, and reduce campaign latency. To delete unreachable customers in real time, the Disney Streaming team uses Amazon Pinpoint to detect when they attempt to send a push notification to an unreachable customer. Their Kinesis Firehose stream then outputs campaign data to an S3 bucket, and an AWS Glue job filters out the customers who are unreachable. 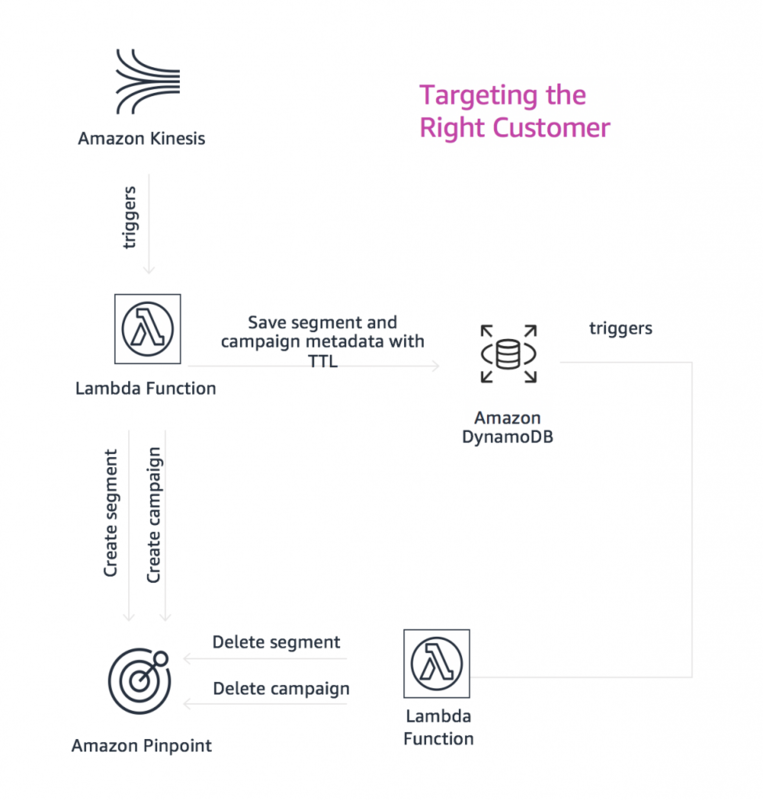 Finally, a Lambda function removes the endpoint by making a call to the Amazon Pinpoint API. You can find more details about how Disney Streaming Services implemented this solution in the recording of their session. You can learn more about the needs that Disney Streaming Service considered when they chose a Digital User Engagement solution by watching the recording of their discussion on the re:Invent 2018 Launchpad stage. You can also watch the Digital User Engagement Leadership Session to learn more about AWS’ Digital User Engagement solutions, information on recent feature launches, and to learn more about how Disney Streaming created solutions to their engagement challenges.